Things are moving along and we are almost done packing so I will be back to posting some great projects just in time for the holiday season. But until that time I have a great treat for you all. is here to share one of her scrumptious recipes with us. I can't wait to make these to have with my afternoon coffee. So grab your coffee, sit back and welcome Elizabeth. Hi everyone! I'm Elizabeth and I blog over at Real Inspired. I love to blog about the creative process and decorating my home. Though I usually stick with my favorite subject, decor, I do post the occasional recipe now and then. Food is good and yummy things should always come with a beautiful, welcoming home! 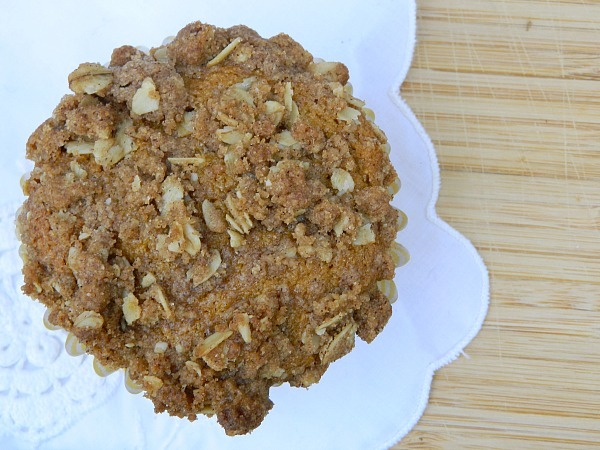 A while back, I stumbled upon this pumpkin muffin recipe by Smitten Kitchen. I loved them and have made them many times since. 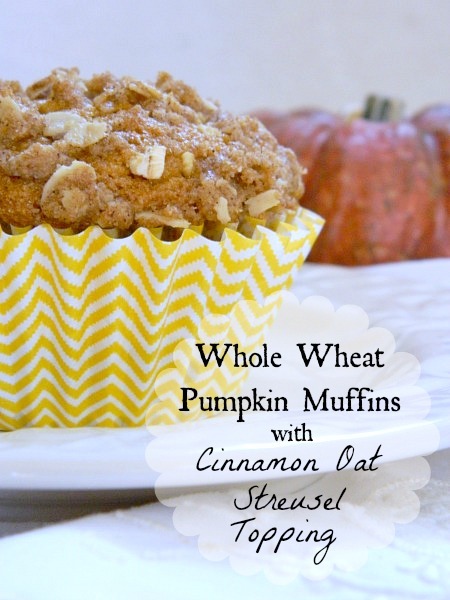 It is my go-to fall recipe! 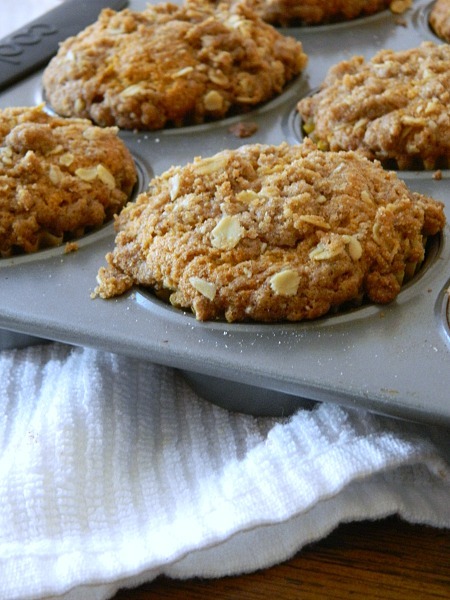 I've made a few healthier tweaks to them by using whole wheat flour and coconut oil, and a not so healthy tweak by adding a yummy streusel topping. Eh, you win some, you lose some. And when winners lose, they eat streusel topping. Preheat oven to 350° and grease or line muffin cups. For muffins, whisk together flour and baking powder in a large bowl, set aside. In a second large bowl, whisk together pumpkin, oil, eggs, sugar, pumpkin pie spice, baking soda, and salt until smooth. Then mix in flour/baking powder mixture until just combined. If the batter is a little stiff, add milk 1 tablespoon at a time until you get the right consistency(I ended up using 2 tablespoons). 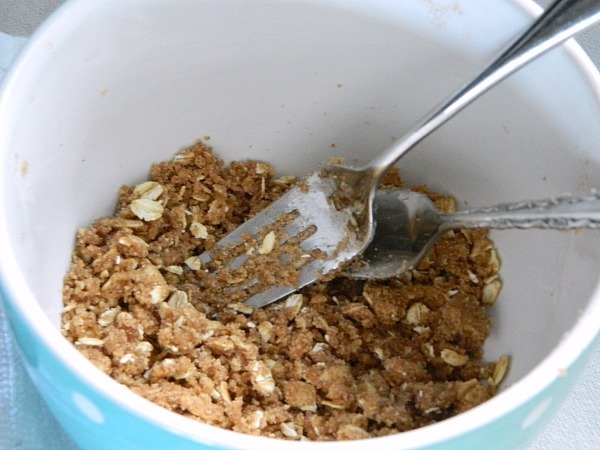 To make streusel, combine flour, brown sugar, oats, and cinnamon in a bowl. Cut in butter with two knives, forks, or pastry blender OR cut butter into small pieces and work in with your hands until it resembles course, crumbly, streusel-y goodness! 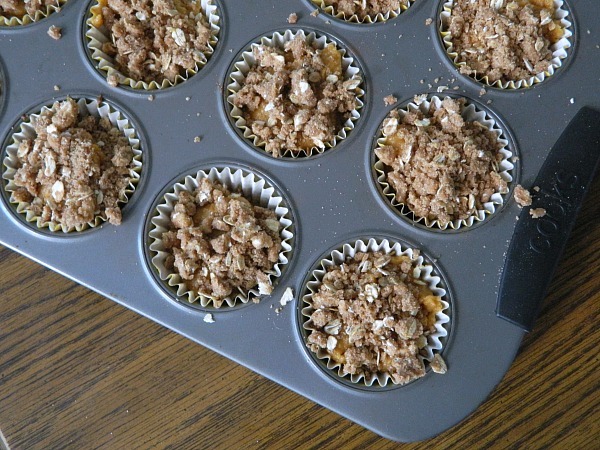 Divide batter among muffin cups and sprinkle streusel on top. Bake at 350° for 25-30 minutes or until a toothpick comes out nearly clean. Cool in pan for 5 minutes then transfer from pan to cooling rack to cool completely. These are my new favorite! They taste as good as they look. Better, actually. I'm a big time coffee drinker and I love having one or two(or three...shhhh, don't tell!) with my morning coffee. 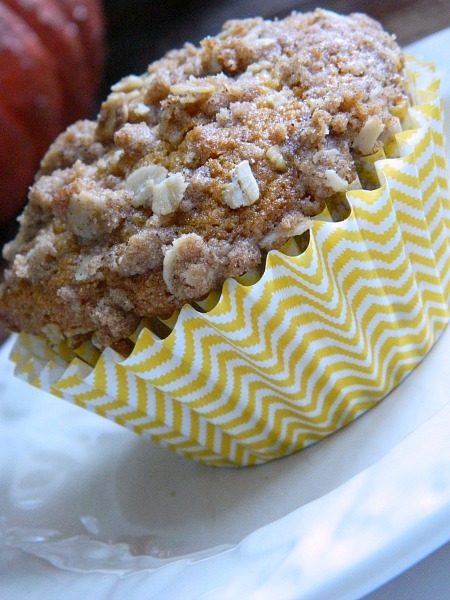 I used to work in a daycare and, once a week for a snack, we would have cinnamon streusel muffins made with a box mix. All the kids and teachers looked forward to that one day! These muffins remind me of those daycare muffins but about a thousand times better! 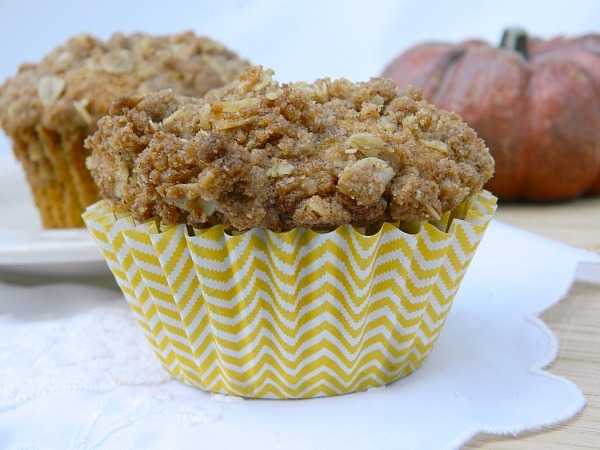 If you want a ton of streusel on your muffins, you could easily double the streusel recipe. We have a family member with nut allergies so I didn't add them, but I think it would taste amazing with some chopped pecans added in too! I hope you enjoy these muffins as much as my family did! Happy fall baking! Thank you Elizabeth! I have to say my mouth is watering right now. Don't forget to stop by Elizabeth's blog and see all her great projects she does for her home. I'm sure you'll find something to inspire you. This looks yummy, Elizabeth! Going to give these a try. Thanks Ashleigh! They are amazing!